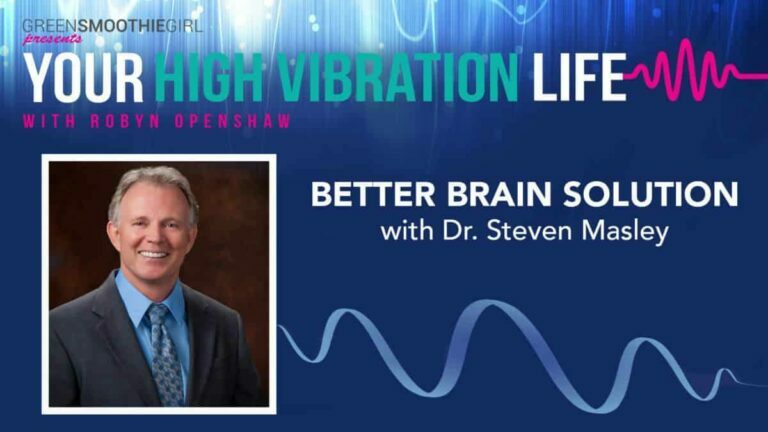 Dr. Steven Masley joins us today to talk about the role of our brain in living a high vibration life. Steven Masley MD is a physician, nutritionist, trained-chef, author, and the creator of the #1 health program for Public Television, 30 Days to a Younger Heart. He helps motivated people to tune up their brain. His research focuses on the impact of lifestyle choices on brain function, heart disease, and aging. His passion is empowering people to achieve optimal health through comprehensive assessments and lifestyle changes. As a best-selling author, he has published several books: Ten Years Younger, The 30-Day Heart Tune-Up, Smart Fat, and his latest book, The Better Brain Solution, plus numerous scientific articles. His work has been viewed by millions on PBS, the Discovery Channel and the Today Show. As a speaker during his career, Dr. Masley has spoken for over 300 physician continuing medical education (CME) events, and for over 700 public presentations on a variety of topics related to health, cognitive function, aging, and cardiovascular disease. He continues to see patients and publish research from his medical clinic in St. Petersburg Florida, and he offers weekly blogs on his website, www.DrMasley.com. Robyn: Hey, everyone. Welcome back to Your High Vibration Life. This is Robyn Openshaw, and I have a really great interview for you today. I’ve been reading the brand new book coming out by Dr. Steven Masley, MD. He is my friend, and he is the author of a number of books. He’s a physician, a nutritionist, a trained chef, and author and creator of the number one all-time health program for public television. It’s called 30 Days to a Younger Heart. He helps motivated people tune up their brain, their heart, and their sexual performance. He’s a fellow with three prestigious organizations: The American Heart Association, The American College of Nutrition, and The American Academy of Family Physicians. He’s also a clinical associate professor at the University of South Florida. He really researches on the impact of lifestyle choices on heart health, brain function, and aging. Dr. Masley’s passion is empowering people to achieve optimal health through comprehensive assessments and lifestyle changes. As a best-selling author, he’s published several books: 10 Years Younger, The 30-Day Heart Tune-Up, Smart Fat, and his latest book that’s just coming out is The Better Brain Solution, and that is the one that I am reading. I am really interested in it because I just turned 50 this year, and right about now, we start thinking about our memory. He’s been watched by million on PBS, The Discovery Channel, the Today show. He’s done over 500 media interviews, but he’s still seeing patients and publishing legitimate research from his medical clinic in St. Petersburg, Florida. We’re actually talking to him right after he got power after Hurricane Irma, so that’s a real challenge to be with us. Thank you so much for being here with us, Dr. Masley. Steven: Oh, I’m delighted to be you, Robyn. Robyn: Well, it’s good to, quote-unquote, “see you” again online. I saw you a few weeks ago at a conference, and I’ve been reading your book. In the introduction, you say that when asked, people are more fearful of losing their mind, their memory, that kind of thing. I would imagine that’s probably because most of us have watched an older relative disappear on us due to Alzheimer’s or dementia than cancer. People are more afraid of that than cancer. Is that true? Tell me a little about that. Steven: That’s really true, and it’s terrifying. I think all of us have these little moments like we walk into a room, we can’t remember why we’re there, but if they become recurrent and they’re often and frequent, then that’s a sign of real memory loss. Brain fog is so common today. I think some of the reasons that it’s scary is because our brain gives us our identity, who we are, but when we lose it, not only do we lose our own health and we suffer, we become a burden to the people we love, and nobody wants that. Nobody wants to be a burden on our loved ones. This is the most expensive disease in America today. We spend more money on it than anything else, and we’re appropriately afraid of it. I want to help people improve their brain function and prevent memory loss. That’s my goal. Robyn: Why is incidents of dementia, as in Alzheimer’s, why is it skyrocketing, if you could boil it down. Steven: No, you’re right. It is skyrocketing. It’s going to double in just the next 12 years, and the number one cause for that is abnormal blood sugar control, and what I would call insulin resistance, that when we eat too many refined carbs, the wrong foods, things you wouldn’t recommend, then it messes you up. It mess up your blood sugar control, and that, I think people are just now discovering how terrible that is for our brains, and we didn’t realize this until recently. Here, we have diabetes increasing at epidemic rates, and because of that, we have memory loss and cognitive dysfunction and brain fog increasing at an epidemic rate too. Robyn: Well, you may have kind of answered, somewhat, my first question for you, but what are the most important risk factors that people should know about related to early memory loss? Steven: Well, number one is just mild elevation in blood sugar causes major cognitive dysfunction, so if your blood sugar’s up just a little bit, that’s really bad, and I … Most people think, “Okay, I’m not diabetic. I’m fine.” Well, that’s not really true. A head injury, a concussion increases your risk by 300%. A history of depression, this is a little surprising, almost a 3-400% risk increase for Alzheimer’s and memory loss if you had a major depression in your life. Concussion, depression, those are common, a family member with memory loss/ Alzheimer’s disease, and then APOE4 genotype, which is 20% of our population. Blood sugar, head injury, depression, family history. Those are the big markers that make a big difference. Robyn: You mentioned thE APOE4 genotype. That’s APOE, everyone, APOE. A-P-O-E-4, APOE4 genotype. You mentioned that and also your blood sugar. How would I get tested for both of those things? How would I know if my blood sugar is high over a period of time. Steven: Blood sugar is pretty easy. Most people when they go to their medical provider for a regular annual checkup, probably most of them get their blood sugar checked, and you can certainly just ask, “Hey, would you please check my fasting blood sugar? I’d like to know what it is,” so that’s simple, but signs of elevated blood sugar are that your waistline’s expanding, your blood pressure goes up, your cholesterol profile gets worse, like the HDL number drops, so those, or you’re inflamed, more inflamed. Those are the signs that your blood sugar is becoming abnormal, and you get those signs 10 years before your blood is even high. The first sign, though, is an expanding waistline, which none of us want, right, but the APOE4, that’s more complicated. I would really think of that would, it’s moderately expensive, although now you can get it with 23 and Me. If you do the 23andMe test, they’ll tell you your APOE4 genotype status. Robyn: That’s just a saliva test, and pretty cheap, isn’t it? Steven: Yeah, like $99, and you get all this genetic information. I mean, that’s a deal to get so much information about your genotype and your, yeah, it tells you many risk factors including that scary one. Robyn: 23, number 23, everyone, andMe, spell out andMe, but 2-3 are numeric. 23andme.com. You can get this $99 test, and it doesn’t just tell you if you have the APOE4 genotype, it tells you lots and lots of things including about your ancestry, and you might actually be surprised about that. Steven: Yeah, how cool is that? Robyn: Yeah. All right, you talked about some risk factors, some of which were probably surprising to most of us, the TBI, traumatic brain injury, a history of depression. Those feel like things that either they happen to us or they didn’t, and there’s much we can do about them. Tell me a little more about the role of insulin resistance in cognitive decline, which is a major subject of the book. When you reach insulin resistance, that’s when we’re gaining weight around our waistline, but at the same time, here’s the weird thing, brain cells, when they feel like, “Okay, I’m going to resist insulin’s message,” they become unable to use energy at all, and they become dysfunctional. It’d be like if someone put the wrong type of gas in your car, the engine wouldn’t run. When you consume out-of-control carbs and you get this insulin resistance message going on, your brain cells are unable to use the sugar in your blood, and they can’t use the sugar properly that’s in their cells. Their motor won’t run, and brain cells, you get brain fog or forgetful or unfocused. Those are the signs. I think everybody’s had them at some point, and next thing you know, your brain’s dying, and that’s a bad thing, but it’s so common. We’re talking about 25% of all adults, and 50% of baby boomers have insulin resistance, 50%. It’s a huge number. Millions and millions of people are at an increased risk not just for heart disease, but serious memory loss too. Robyn: I noticed that you mentioned refined carbs, and I’m glad to hear you say that because there’s so much about carbs as if all carbohydrates are bad. Twenty years ago, when I was raising my little kids, I remember our pediatrician saying, “If they’re, they have upset stomach, just get some sugars in them,” and I said, “What do you mean sugars?” I remember our pediatrician telling me, “Have them drink some Sprite,” and I said, “Well, wouldn’t I want to give them some apple sauce or that I, homemade apple sauce or something? Like really? Sprite?” He said, “Doesn’t matter. Simple sugars.” It used to be simple sugars and more complex carbohydrates. Can you tell me what the difference is between refined carbs and maybe simple sugars found in whole foods like fruit. Is there a difference? Steven: Oh, it’s a huge different, and you explained this really nicely in a lot of your material. When we unprocess like an apple or a cup of broccoli, that has a lot of fiber in it, and the fiber binds to your sugar so your sugar doesn’t jump up high and spike. It comes out slowly and gently over time and provides us with a steady flow of energy. What we don’t want is a spike. Now, when you have something like sugar, it’s going to spike up high, and then your insulin spikes, and then you get that back-to-back double whammy. Now, here’s what many people don’t, underappreciate, that when they have whole wheat, when you take flour, a grain, and process it into flower, it has the same response as table sugar. Whether it’s table sugar or white flour or whole wheat flour, they all act the same way in your blood and have that sugar spike effect. What we want is carbs that don’t cause your blood sugar to jump high, so low glycemic carbs would be like blueberries and cherries and watermelon and an apple, or any of the vegetables except for a potato, basically. Nuts and beans have a very low glycemic low. What has a high glycemic load would be anything made with flour or crackers or chips, bread, granola, processed cereal, and obviously sugar itself. All those things wreak havoc on our brain function and our health overall so it’s really an important distinction between eating carbs that have a low glycemic but have lots of nutrients, phytonutrients, and then those that are just kind of empty and sugar-releasing. Robyn: That’s a really helpful explanation. From your clinical experience, you’ve worked with thousands of patients as well as a researcher. Can we improve our cognitive function? Steven: Yeah. Big, in a major way. I mean, I’m pretty impressed. I’ve been seeing patients for 20 years, and I’ve had this Better Brain program, really, at least for a solid decade, 10, 15 years where we’ve been offering this, and I measure cognitive speed and function in all my patients. When they first come to see me, we publish data from our clinic. We look at what do you eat, how active are you, how do you manage your stress, all these lab markers, your body fat, all these things, and we actually have published on what predicts great brain processing or terrible brain processing. We have hundreds of people who’ve improved their cognitive performance over time. We’ve actually measured, well, what things could you do that make a difference like exercise or eating the right food or getting the right nutrients. We’ve done randomized clinical trials, meaning we put people in an intervention group, and we randomized half of them to just a control group where they were going to wait and start later, and we saw no change in the control group, but we saw 25% improvement in executive function pretty quickly that persisted and lasted long term, so we know what we can improve your brain processing speed, and that’s the key to helping prevent memory loss. We publish that. My patients reported every time I see them, within a month, they’re mentally sharper, quicker, and more productive, and I think that’s wonderful. Robyn: Talk a little bit about executive function because there are different ways that the brain works, and so for instance, I would say that at this age, I am forgetting who I told something to yesterday, like I remember telling somebody of my 22 employees to do something, and sometimes, I can’t remember who I told it to, and it worries me a little bit, but I’ve never had brain fog. Talk about executive function and what other ways of looking at what’s going on with our brain that we should be evaluating. Steven: There’s memory, trying to remember a word or remember a shape. That’s a memory component, but processing is like when you have to solve a problem. You’re working on a problem, you get interrupted, you have to get back into it. How quickly do you process the information, and this takes millions and millions, hundred million synapses in our brain. It’s like all these circuits are involved in executive brain function. That’s really complex decision-making, and that’s your ability to get stuff done, so if you want to be productive, if you want to deal with the problem and solve it, and then, and here’s the other thing: Many people are interrupted up to a hundred times a day. If they’re working on a big daily project, like you’re writing a new chapter in your book or something, and you have an awesome new book, when you’re doing that and you get interrupted it can take seconds or minutes to get back into your speed. That kills your productivity. We want people to be sharp and quick and to be able to jump from one task to another rapidly and solve their problems as quickly as possible. That’s really your measure of executive brain function, your ability to jump from task to task quickly and get stuff done, and do it really efficiently. That’s a little different than just trying to remember a phone number, but they’re both really important, and we need both. Robyn: Yeah, what do you think about the fact that, in 2017, we are having to multitask like never before? We have so many technologies, we have so many gadgets. We are multitasking because there’s all these technologies that create these efficiencies, and they’re efficient, but they make us, I feel like my brain is exploding some days. I feel like I’m doing 50 different tasks. Steven: I know what you mean. Isn’t that, because, and they’re distracting us, and they’re interrupting us. We’re not doing it on our schedule. Sometimes, these gadgets start to work on their schedule. I don’t think that’s harmful, but I think it shows the more distractions you get, it’s getting harder and harder to get stuff done, and that’s where your executive function is so important that you can just plow through and do two or three things at once as you work though projects and problems, and you get interruption, and your 20-person staff comes to talk to you. I think that’s really the key is that we can just keep going forward … It’s like a computer speed. I think a lot of people have been on a computer, when it got sluggish, they had to shut it down to get it re-going again. That happens to our brain too, and so we’re trying to prevent that and improve the function of our brain. I don’t think that’s harmful for us to be challenged. I think we want purpose and challenge, and more challenge, sometimes, the better, as long as we manage it. Robyn: What do you have to say about what we should spend our time doing, like doing jigsaw puzzles, socializing? What’s good, and what’s bad? Steven: The bad … We don’t want unmanaged stressed, we’re so stressed out that we can’t handle it. That’s harmful to our brain because we make cortisol a hormone, and that’s fine when we’re being chased by wildlife 100,000 years ago, and you’re just trying to get out of the way, but if that’s every day, unmanaged, prolonged stress is really harmful. That cortisol shrinks, literally, shrinks your brain, especially the memory center. There’s a lot of toxins in our environment now we never had to deal with before, not just tobacco and excess alcohol, but now we have nitrosamines that they put in processed meats like bacon and sandwich meats and deli meats that are brain-toxic, and they’re common. They’re all over the place out there. What I’m trying to do is help people identify what are the toxins they could easily avoid, how do you help manage your stress to get rid of that. Stress and toxins are things we want to get rid of. Things we want to add, to me, that’s the fun thing to talk about. There’s specific foods that are really good for our brain. There’s nutrients that are essential for our brain, so I like focus on the foods and nutrients that we should add that help us improve cognitive function immediately and help to prevent decline over time. Robyn: Let’s go to the foods. You mentioned, if we talk about foods that people should avoid, I’m so glad that you mentioned cured or processed meats, anything that you put on a pizza, basically, or if it goes in a deli sandwich, the nitrites and the nitrates, the nitrosamines, like you said, that tops the list. What else? What other toxic foods should people avoid? Robyn: Thank you for saying that. Steven: … really the animal products. Robyn: … of, “I only eat organic produce,” but then they eat all these conventionally grown animals, and those tissues and organs build up all the conventional produces’ herbicides. Steven: You’re absolutely, Robyn, you’re absolutely right on that. You’re dead-on right. But on the produce list, I look at the dirty dozen, so I try to think, if we’re going to do organic, the things would make organic would be any dairy or animal protein people eat, that it would be the dirty dozen, like the blueberries, the cherries, apples, bell peppers, common things, but those are actually pretty easy to get organic, and they’re even a lot less expensive because there’s so much production for them now. Those are the big ones, and then maybe coffee and tea, if you drink coffee and tea. I’d look at the … We use a lot of pesticide spray. Those are probably the three groups that I think are most important. I try to give people tools for that with the program for a Better Brain to, you make sure that you’re avoiding these common things that are out there. Robyn: … just not the case anymore, is it? Steven: No, you’re absolutely right. It’s so much easier to find these things, and the prices have really dropped. Robyn: Yeah, so we talked a little bit about what to avoid. We’re going to avoid nitrites, nitrates in our meats. If we’re going to eat animal products, we gotta get the, what, wild-caught, organic, free-range? Steven: Yeah, wild-caught, cage-free, organically fed. That’s getting easier and easier to do. Robyn: Yup. It’s getting easier, and it’s getting less expensive. It used to be that those industries were so propped up by government agencies, and they still are. I mean, they’re still very propped up, and if those price supports fall out, we’re going to find ourselves unable, many people, unable to afford those, and so I’m a big fan of people just learning to eat more plants, but … You are a chef, in addition to a medical doctor. I don’t know how you had time for that going through medical school. I don’t even get it, but you’re a really great chef, huh? Steven: Well, I actually went through the Four Seasons and did a chef internship while I was a physician because I was doing research studies, and when I realized what people really wanted was not just how many grams of fat or carbs to eat, they wanted recipes that were easy to make, delicious, and you could find the ingredients at store. If you could give them that, food that was good for your heart, brain, and soul, and it was easy to prepare, and people loved it, that’s what they ate. I used to cook, like in college, I would cater dinners. I liked cooking, but I took it to a different level when I realized that if we’re really going to change health in America today, we need more recipes, so I started, I went back to chef school. On evenings and weekends, I worked in a restaurant at the Four Seasons, and it was really a good experience for me to this day. I’ve got 50 new recipes in my new book The Better Brain Solution. I love these recipes because they’re delicious, they’re fun to make, and it’s really, your family will love them. Robyn: Yeah, I love that you aren’t … I mean, I remember reading Joel Fuhrman and McDougall and all those guys, and they were heart doctors, and they were like, “You gotta eat two pounds of vegetables and no fat,” and since then, your last book, being Smart Fat, one of the things I love about your mission, Dr. Masley, that I share is a passion for teaching people that eating really healthy doesn’t mean that you’re eating yucky food. Do you agree? Steven: Absolutely. No, I’m totally with you, Robyn. Food’s gotta be delicious, or we’re not going to eat it, and it’s trying to learn to use fat, healthy fats, smart fats in the right way with spices and herbs. When you put them together, your food can taste fabulous. I love doing cooking classes and things like that because of it because that’s how you transform people’s lives. Robyn: Everyone should check out Dr. Masley’s recipes because he’s a bit of a gourmet as well as a doctor, and you don’t usually find those two things together. Let’s talk a little bit about supplements because there’s just probably, it’s probably a billion-dollar industry selling people supplements for your brain. What are the top four or five supplements that we should be taking? Steven: Nobody should be vitamin D deficient. That’s like crazy. It’s, worsens your cardiovascular health, your cancer risk, and your brain health. We should get at least 2,000 international units, some people need more, but almost everybody needs at least 2,000. I use a vitamin D every day. That’s a no-brainer. We should gain a good multi that has, so what’s a good multi? It’s hard to get it in the grocery store. That’s a hint. Something that’s got mixed folates, not just folic acid. It should have all sorts of forms of tocopherol. Vitamin E isn’t just alpha tocopherol, it’s mixed tocopherols. It would have adequate B-12 because B-12 deficiency’s really common today, and when you’re low, that can cause permanent, irreversible brain damage, so we don’t want low B-12, so adequate B-12. Chromium is good for insulin sensitivity, so we just need a trace to get plenty. Those are just some, so vitamin D, a good multi, and actually, a really good multi probably has adequate vitamin D in it. Then a probiotic because our gut is so important for our brain health. Then magnesium, if I was to pick four things, I’ll try to limit myself, so if you’re really going to prioritize, there’s other things that I think effective that are really exciting, like maybe even curcumin, that curry spice, but the top four. Let’s make sure we get our vitamin D, a good quality multi, and I give people all the tools to figure this out with the program, Better Brain program, and a probiotic and magnesium. Those would be my top four things not to miss. Robyn: What about CoQ10 and resveratrol that you always hear linked to healthy brain? Steven: I think those are really fascinating, and I do, especially for people who are high risk or have early symptoms of cognitive decline. They get pricey, so suddenly, you’re up to, you’re jumping from 20, $30 a month, so you’re doubling that cost, so I’m trying to really prioritize. I think the vitamin D, the good quality multi with B-12, the probiotic, the magnesium. Those are like slam-dunks, and they’re not that expensive. I think the research behind CoQ10, curcumin, resveratrol are fascinating. There’s some early studies that shows some benefit. It’s just not as solid in terms of when you look at how many studies they’ve published, how many patients have been in them, have they really shown long-term results? Yes, those are some of my favorite other additional supplements I talk about after you’ve got the basics. I think you hit them really nicely. All of those things I think are really important for your brain. Robyn: I want to ask you about stress because there’s so much to talk about stress, and stress is bad for you, so the fact that I have deadlines and I’m doing hard things in my work. I want to ask you if there’s a good stress and a bad stress because, for instance, you and I right now, one thing we have in common is that we’re both doing a book launch, and we would both like get our message out there to more people. We would like to hit the New York Times list, and big goals. Big, hairy, audacious goals. Are those bad, or should we just be going to the beach and doing as little as possible in our career, or what’s the difference? Steven: I love that, because you want purpose and challenge. Just like we need to exercise our muscles, we need to exercise our brain, so we want challenge, but what we have to do is proactively manage it. We have to do those things that generate positive vibration for us. Like you about in your book, that we want that … You need adequate sleep, you need loving hugs, you need soothing in your life. We need things that are nourishing and supportive and helpful, and you need to schedule them. You can’t just … I mean, let me hope I have time to meditate today. I mean, that’s not going to happen. You have to plan to meditate and schedule it does happen. When you proactively manage your stress, you can handle all sorts of challenges. That’s the differences. Robyn: I like that. Let’s say that we find out … What percentage of the population has the APOE4 genotype? Steven: Oh, I’m sorry to hear that. Robyn: … so I probably have that risk factor. Yeah, my children have it on both sides of their family. Their father’s grandpa died of Alzheimer’s. What special tips should anyone follow who is APOE4 genotype, or let’s say they don’t get tested and they think they might be because of their family history. What should they do to prevent memory loss? Steven: That’s a great question because there’s several things you can do. A lot of people are like, “Why would I test? It’s just bad news, right?” Well, no. It is some bad news, but there’s a lot we can do to stop. That genotype means we’re more inflamed and we’re better able to fight infections. That’s a genetic advantage, but it also means we have a bigger chance having high cholesterol, heart disease, and memory loss. The things that we’ve known from studies that really help, one, the Better Brain program would be so important because we really focus on low blood sugar and no insulin resistance. People with APOE4 do not tolerate abnormal blood sugar. That just kills them. Kills them off. One, you want really good blood sugar control because that makes a big difference. Two, exercise. People who have the APOE4 do a lot better if they work out, like for the Green Smoothie tennis-playing girl, yeah, I mean, more activity is really good. That’s a positive. Fish oil. Here’s the irony: Fish oil is extra important, and I didn’t mention that in my nutrients. I probably should have, but fish oil is important for everybody, but people with the APOE4 even benefit more. They probably benefit double from getting fish oil than the regular, rest of the population, but they don’t absorb it as well. They need double the dose. They need to take extra, like instead of a thousand milligrams of EPA and DHA daily, they probably need 2,000 to really get that full benefit, and they benefit more than most people. Then fasting. There seems to really be some evidence that fasting helps people with the APOE4, so they should be skipping breakfast a few days a week. I mean, there’s a lot you can do if you know you have it, and it’s real, and I think the evidence is that it make a big difference. Robyn: Interesting. What do you think about the longer-term fasting. You’re talking about 12 or 16 hours a day. What do you think about … Now, this is pretty controversial, and I haven’t really talked about this in my podcast, but last year, I did a seven-day fast, a 9-day fast, and a 12-day fast. What do you think about that? Steven: Well, you’re going to release, you’re going to metabolize and release fat, and a bunch of toxins will come out, so you’ve really gotta be detoxing. I mean, you’d have to be a really healthy person like you. For you to do that, I don’t have too much concern because I know you’re going to carefully and appropriately, and you’re in good health, and you’re probably detoxing the whole time you’re doing it and supporting that toxin release from fat cells. An average unhealthy person doing that who doesn’t have the nutritional detox capacity in their liver? That would scare me a little bit. I’d much rather they do it in a gentler, softer way, and they do two to three days a week of a 14, 15 hour fast instead. Robyn: Awesome. I know that you have offered to give my readers a little gift, a really great deal. It’s at greensmoothiegirl.com/betterbrain. We’re setting that up in honor of Dr. Masley’s new book, The Better Brain Solution, so greensmoothiegirl.com/betterbrain, and it’s a 30-day challenge. If you jump in on it, you’re going to get the book free. Tell us a little bit about it. Steven: I like … We have a quiz that they can have, take. They could see kind of a brain symptom score, how is their brain doing. That’s going to be free that we’re going to offer the quiz, and we’re going to offer a sneak preview of my PBS show, The Better Brain Solution. That’s going to give them detailed information on the five steps they can follow to have a better brain. That’s just free. Now, if they want to take additional, the next step, if they really want to get support and dive in to those five steps, then we’ve got information for them, extra recipes. I want them to do a 30-day Better Brain Challenge. I would like their brain to be sharper, quicker, more productive, less forgetful, and prevent memory loss, and join a 30-day challenge with me. We’ve got the sneak preview of the PBS show that’s only limited for a very short time, and a quiz, and then I want them to try this Better Brain Challenge. Who wouldn’t … If you have a brain you need the Better Brain Challenge. I mean, who wouldn’t want to be mentally sharper, quicker, and more productive? Robyn: I love it. Did we miss anything that you really love to talk about with regard to your new Brain book? Steven: Boy, I think you really nailed the essence of that book. I would like to say one thing though, and here’s, this is, I think it’s about human nature in general. A lot of people are procrastinators. We wait for something bad to happen before we take action. The problem is, by the time you notice you’re getting forgetful and your brain isn’t as sharp as it used to be, it’s shrunk. I’ve watched dementia and Alzheimer’s on a personal level with my own family members. I’ve seen this, and I know how awful it can be. I don’t want anyone to go through that, so I want people to take action now. I want you to say, “I’m not going to allow myself to lose my memory in the future, and I want a quicker, sharper, more productive brain starting today.” Do this now. Don’t wait until you have signs of memory loss and your brain has shrink from a grape to a raisin. That’s too late. Take steps now, get going, take the 30-day Better Brain Challenge, improve your brain production in just 30 days. That’s really my key take-home message today. Robyn: That is great advice, and I’m really excited for your book to come out. I’m really enjoying read it, and so thank you so much for being with us in the hot Florida heat right after hurricane. You are amazing, Dr. Steven Masley.